Nicole Richie, alongside childhood pal Paris Hilton, was one of the first reality TV stars and rich socialites to be known as 'famous for being famous'. Now she's back with the second season of her VH1 reality show, Candidly Nicole, to give you an unfiltered insight of what she does when she's not counting all that money back at her mansion. 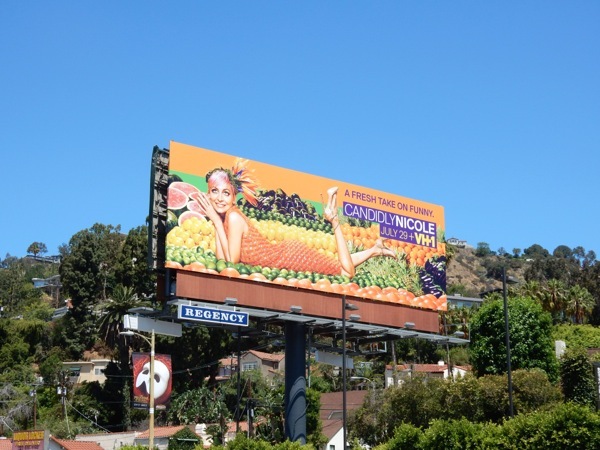 As you can see from this fruity billboard, which was snapped along Sunset Boulevard in West Hollywood on July 10, 2015, she's no shrinking violet (although it's hard to imagine her doing her own shopping in the produce aisle). You can also see the Nicole in these billboards for Fashion Star which ran on NBC for two seasons before being cancelled. One thing you can guarantee, this show is all about her and attracting as much attention as she can muster.